In a time when District 284 youth hockey players skated outdoors in used gear or bulky snowmobile suits, when fathers shoveled snow from neighborhood rinks, and when mothers had to rub their sons’ toes in the warming house between shifts in a game or practice, the idea of forming an association and taking the hockey game indoors was formed. In the spring of 1968, Ed Miller, then Wayzata High School hockey Coach, approached the fathers of the 184 boys then playing hockey under his guidance and suggested forming an organization. A formal association, he said, would allow more boys to participate in hockey, as well as give him the assistance he required to continue with the program. The time was ripe for developing an association and expanding the youth hockey program. With the debut of the Minnesota North Stars in 1967, a craze for hockey erupted. High school and youth programs emerged across the state, and even though it wasn’t highlighted, even a few girls programs developed—including one in Wayzata that was coached by Dr. Robert May, a father of two girls on the team and a Wayzata dentist who also served as the team dentist for the Minnesota North Stars. “It was just hockey fever out there with the North Stars at the time,” says Jack Dorsey, the association’s first president. About 45 hockey parents gathered at Hart’s Cafe in Wayzata on March 23, 1968, eager to discuss the formalities of a program. Dorsey, the father of seven boys and three girls, all hockey players, was nominated as the President of the District 284 Youth Hockey Association. While he initially wanted his sons to follow in his footsteps on the basketball court, Dorsey accepted the offer to preside over the association and remained in that position for the next eight years. “I saw what the program was about and since that time, I’ve been very enthusiastic about hockey and the hockey program,” says Dorsey. With zealous support from the growing Wayzata bedroom community, the newly formed association built six lighted outdoor rinks at the elementary and junior high schools. Warming houses were built and light poles were raised. Many kids learned to play hockey at Klapprich Rink, still a favored Wayzata outdoor rink. But the program was in poor shape: Miller’s high school team had few wins and fault was placed on the lack of practice ice. The team either practiced on the high school’s outdoor rink or was occasionally bussed to indoor arenas across town which was time-consuming and costly. 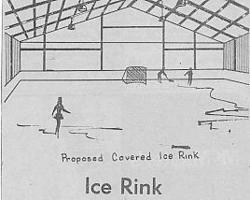 Artificial ice was a novelty, with Edina and Minnetonka the only cities in the area that owned indoor rinks. Each bus trip cost the team $20 and renting ice was $40 an hour. About a year after the association was formed, Bob Penningroth, a Wayzata hockey parent, approached Dorsey about building an indoor hockey rink for the school district and youth program. Some board members traveled across Minnesota and spoke with other organizations about the intricacies of building and maintaining an indoor ice arena. Dorsey also traveled to New Jersey to investigate Icemat, then a newly developed mat system that would allow better freezing of the ice. Wayzata was one of the first cities in Minnesota to install the system. The mats also enabled the rink to be disassembled during the off-season for other events and activities such as school dances. According to Dorsey, however, the arena was only utilized by the hockey programs, a few gym activities, and the high school baseball team for preseason practices. Using the information from their research, the association members proposed to the school district in 1970 their plan to contribute money toward the construction of an unheated ice arena with a dirt floor, no spectator bleachers, and a metal roof over natural ice. To save money, the board decided to forego adding a refrigeration system to make artificial ice until later. The building would provide ice from November through May and would be built adjacent to the high school, (Today is the Wayzata Central Middle School). According to Dorsey, the building was later referred to as “the barn” , or the "Tin Can" by other associations. “It was cold inside that metal building during the wintertime. But it was great ice,” he says. By then, nearly 400 boys were skating in the district’s hockey program. Once the rink was built, it would be donated to the school district with the stipulation that the school would be responsible for the management and maintenance of the ice, and that 700 hours of free ice time was guaranteed to the youth hockey program. Under the direction of Penningroth as the chairperson of the Covered Ice Rink Booster (CIRB) fundraising committee, the association’s efforts took off. “[Penningroth] was the guy behind the whole fundraising program. He wouldn't take ‘no’ from anybody, and he would be out talking to the businesses and places like that,” Dorsey said. “Bob was a doer, and he kept after it and kept after it and kept after it.” Initially, all district hockey families were asked to make a three-year pledge toward the association’s $100,000 commitment; the school district agreed to cover the remaining cost of the arena. Later, once it was established to be more financially advantageous to add the refrigeration system during the initial building process, another $80,000 was needed. This would also cover the cost of adding bleachers to the arena. A second pledge request ensued. Eventually, the hockey association’s commitment escalated to $200,000, and in the fall of 1974, heaters, insulation, a refreshment stand and lavatories were installed. Support for the covered ice arena came in letters from the Minnesota Amateur Hockey Association and other districts that indicated their interest in purchasing ice at Wayzata. But once the rink opened, the ice was rarely vacant. “We couldn’t keep the kids out of there. We always had something going on with house league games and traveling games,” Dorsey recalls. The enthusiasm for the youth hockey program and the excitement over building an indoor rink was shared by the entire community. Hockey parents were not only asked to make personal pledges, but were also asked to raise at least $150 per family through outside sources. Neighborhood businesses readily contributed to the arena, including Wayzata State Bank which purchased and donated a $12,500 zamboni. Hockey players went door to door selling chocolate bars for 50 cents and cans of unpopped popcorn, and hockey parents attended a yearly fundraiser at the Old Log Theater. Youth and teens donated their paper route and yard work money. Income from sponsored golf outings, raffles and a flea market poured into the kitty. Money even came from the beyond: M.G. Gullixson, the former publisher of The Minnetonka Herald (later named the Minnetonka Sun), died in March 1968 and left an endowment fund of $40,000 to be used by the youth in Wayzata. “It was just a tremendous community effort,” says Dorsey. “Everybody was as enthusiastic as could be. This was what we had to do. It was a year-round effort.” Even the Wayzata High School hockey players pitched in to help. Fifty-four boys in the ninth, tenth, and eleventh grades signed a 1,000-hour group pledge to help with the construction of the arena including clean-up, interior painting, installing the rink boards, landscaping, putting up the bleachers, and general maintenance of the building. The boys also donated the money they earned refereeing hockey games. “It was just a groundswell that was going on. The boys wanted to give something back. They didn’t have any jobs, they weren’t making any money, so they said they would give their backs and their muscles to help wherever they could,” Dorsey says. His son Mike was one of the boys on the list, as were Bob Penningroth’s son Jim, and Pete Carlson, a former Junior Gold coach for WYHA. 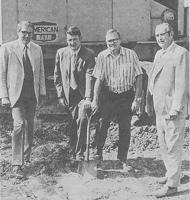 The construction of the building, which was delayed because of a labor strike, began with a ground breaking on Aug, 28 1972 and was completed in November 1973. The arena was flooded for 48 hours nonstop over Thanksgiving weekend and was ready for the first blades to hit the ice on Monday, Nov. 26, 1973. Another round of pledges was requested to cover the remaining debt of $4,000 by the following January for a total association commitment of $200,000. Eventually, after four years of fundraising, the ice arena was paid off and the goal of building a covered ice arena had finally come to fruition. “I just can’t get over how much it was the spirit and talent and enthusiasm to get the program going. Everything was ‘Let do it. Let’s get it done,’” Dorsey says. “It was a wonderful time in our lives to be involved in all that. My wife and I would pass each other on the weekends. She’d be taking boys one place to skate, and I’d be taking boys another place. It was just a way of life. That’s all. That's all it was.” When the ice arena was completed in 1973, about 750 boys were enrolled in the District 284 Youth Hockey Association. With an increase in scheduled practices, the Wayzata High School hockey team went from seeing few wins to becoming a team to contend with. Today, an additional three arenas later, nearly 1,200 boys and girls play hockey for the Wayzata Youth Hockey Association. Since the start of the District 284 hockey program, the Minnesota North Stars were replaced by the Minnesota Wild, hockey players can no longer buy wooden sticks for only three dollars, and teams rarely schedule practices outdoors anymore. But the covered ice arena that began as an idea 40+ years ago continues to serve Wayzata youth hockey. And it all started with a Coach, some enthusiastic hockey players, and a group of determined parents.